Published October 12, 2014 at 1282 × 1885 in Commemoration. 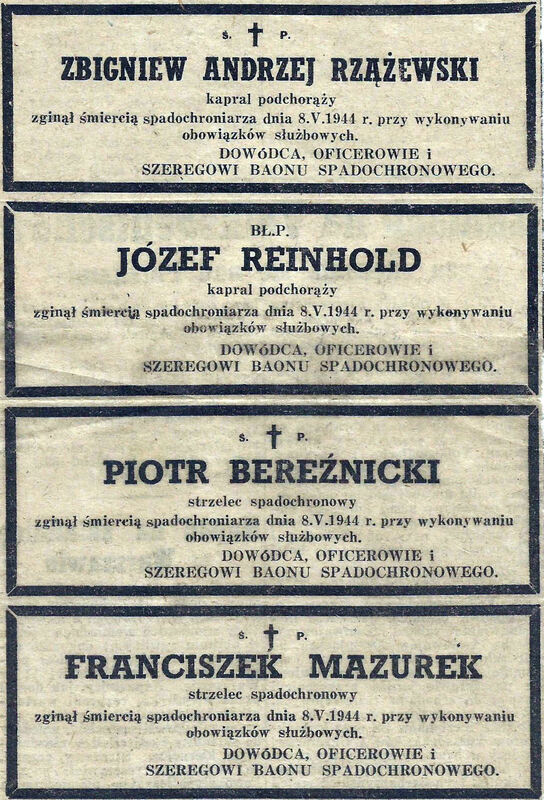 This is the newspaper clipping found amongst the papers of Toni Paszkiewicz, and which commemorates Zbigniew Andrzej Rzazewski, Jozef Reinhold, Piotr Bereznicki, and Franciszek Mazurek. The symbols at the top of each commemoration are spoczywaj w pokoju (Rest in Peace – Roman Catholic) and błogosławiony pamięci (Of Blessed Memory – Jewish). Each commemoration translates as: ‘died the death of a parachutist on 8 May 1944 in the performance of official duties’, and signed: ‘commander, officers and men of the parachute battalion’. Note that the commemoration for Jozef Reinhold gives his date of death as 8 May 1944; his gravestone records 9 May 1944.